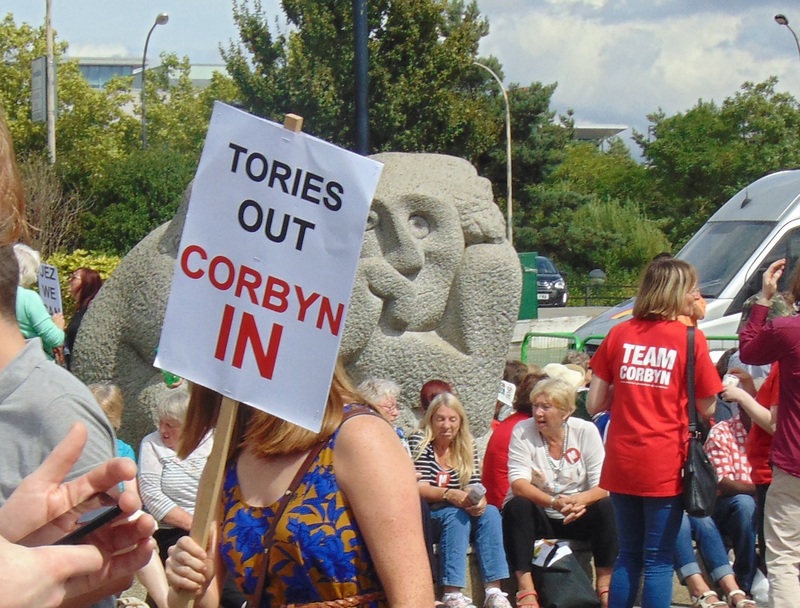 At Jeremy Corbyn’s recent rally in Milton Keynes, one warm-up act proudly declared that “the time of the majority has come”. Quite apart from the alarming disdain for individual rights that line displays, it also betrays a ubiquitously common idea among the left, and people at large, that left wing views and socialist tendencies are common and normal among the general population. Coupled with this is the idea that right wing ideas are a minority element and that Conservative governments are kept in power by an elite minority against the wishes of a left wing populous. The result of the 2015 general election, where 36.9% of voters supported the Conservative Party against 30.4% for Ed Miliband’s reasonably electable (by today’s standards) Labour Party, ought to have dispelled this notion somewhat. If the results for the Tories are combined with those for UKIP, 49.6% of voters chose a right-of-centre party. Throw the DUP’s 0.6% in and it’s over half of all the voters in the UK. Yet the idea that the left are a downtrodden majority came in as soon as that result was announced. Popular demonstrations were held the very same night. This year’s Brexit vote should’ve been another sign. Although plenty of people on the left (quite possibly including the Labour leader) had their own reasons to vote leave, along with many on the right having reasons to vote remain, leave was still perceived as the right wing position to take. Immigration was the key issue at play for most leave voters, that message being championed by the likes of Michael Gove, Boris Johnson and Nigel Farrage. The fact that the option championed by these figures won a national referendum over the one championed by every left of centre political party should really have sent a clear message that this is not a left wing nation. Of course there is nothing new about the right winning unexpectedly. After Thatcher won the 1979 election on a platform of ‘Labour Isn’t Working’, Labour engaged in some infighting that today’s iteration of the party would be proud of. Following that they tried to woo back the electorate with the most radically left wing manifesto of the century, leading them to even more spectacular defeat in 1983. Thatcher’s reduced majority in 1987 coupled with the 1992 recession lead to expectations for a Neil Kinnock victory in that year’s election, but instead John Major, hardly the PR master, lead the Conservatives to their fourth consecutive election victory. It took Tony Blair, a man hated by many in his party for his ‘red Tory’ centrism and embrace of free market principles, to take Labour back into government. His three victories made Labour seem like a realistic governmental force, making it easy to forget the Blair was only the third Labour leader to ever win a majority in a national election in the party’s history. The last time that had happened was Harold Wilson in 1964. Perhaps the reason that the popular consciousness seems to consider itself left wing has more to do with specific issues than overall philosophy. It’s regularly stated that the majority of people favour renationalising certain key industries like utilities and transport, and to oppose the BBC or NHS is tantamount to political suicide. But these popular views are born out of the immediate perceptions of people on those issues, not out of an overall political or philosophical stance. People want those in need to have medical help, so they support the NHS. People want the trains to run on time, so they support nationalisation. People want to watch Doctor Who, so they support the BBC. The fact that free market economics points out that all of these are quite, indeed possibly more, achievable under an economically liberal system is besides the point. These aren’t views motivated by economic theory either. They’re basic default positions, the same ones all of us would take without reading into economics, politics or philosophy more deeply. As such, these don’t point to a socialist majority. Jeremy Corbyn is often labelled a populist for motivating public support around these kinds of issues, but he really isn’t. It just so happens that some of his views align with the public perception. Others don’t, and he’s now paying a price for his commitment to his ideals in continuing to champion those positions. Time and again it has been demonstrated that the British electorate is turned off by hard left ideology. People default to broadly centrist views, taking each issue in turn based on their own ideas, not an overall political persuasion. The latest YouGov polls indicate that support for the Conservatives is standing at 40%, Labour having slipped to 29% under Corbyn’s floundering leadership. UKIP stand at 13%. The period from Blair through to Miliband, when every party was generally centrist, was rightly ridiculed for its lack of real choice in issues. But swinging one party to the extreme end of the spectrum doesn’t fix that. Ideally, options need to exist across the board, so those more radical elements have their voice. But the general public doesn’t sit at either of those wings. It would be presumptuous to come out and state that Britain is a right wing country. What’s seen as right and left wing is really rather arbitrary, and many will associate with supposedly left wing positions on social issues whilst taking a right wing position on economic ones. That could be another thing that’s giving the left its false sense of popularity. What’s certain is that Britain is no socialist country. But the perception that it is, coupled with a left-leaning education system, is putting its future at risk. The older generation can remember the legacy of postwar socialism in the Winter of Discontent and the three-day week. The job now is to make sure the young aren’t mislead into repeating it.